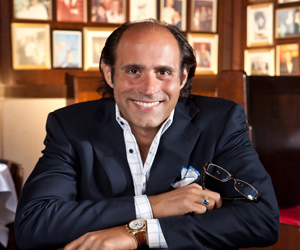 TravelsinTaste.com recently had the distinct pleasure of chatting with Frank -- Frankie to his friends -- Pellegrino of Rao’s family fame. His Las Vegas restaurant, where his wife is executive chef, is one of the hottest on the Strip. Of course, that's no surprise, considering that the original Rao's is known for being the hardest place to get a reservation in New York. We wanted to know why Rao's is so successful, and why Pellegrino's family decided to branch out and give its New York eatery a Las Vegas sibling. So, we asked. Here's what Frankie told us. The decision to open a second Rao's in Las Vegas was a long time coming. "Rao's has been courted by Las Vegas for over a decade," Pellegrino said. "We came close to a deal eight years ago, but the timing was just not right. Of course, Las Vegas isn't just family friendly; it's also flashy, which was also a major draw for Pellegrino and his relatives. "This city's energy is awe inspiring," he enthused. "There is something happening here all the time. The lights, architecture, entertainment, dining and eclectic mix of people truly make this one of the most special cities in the world."